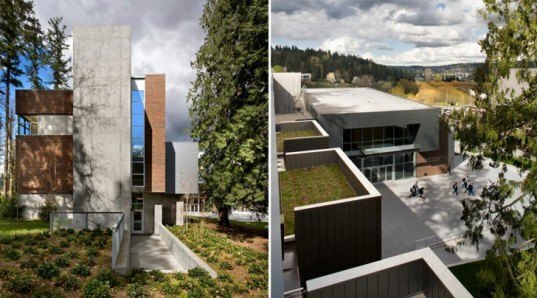 The winter quarter has started with a bang at Cascadia Community College in Bothell, Washington, as the campus' new Global Learning and the Arts Building just received LEED Platinum certification. Designed by The Miller Hull Partnership, this 54,000 square foot classroom and office building will lead by example as an innovative building with a design brought about through interdisciplinary collaboration. The design of the building includes the programmatic separation of private and public spaces, which have different forms of interaction with nature. The more private and contemplative spaces face the forest and provide the occupants with a sense of serenity and calm. The public spaces face the plaza and invite collaboration through participation. The plaza is also used as an outdoor classroom. The building integrates a variety of sustainable features including rainwater harvesting techniques for greywater, green roofs, and the reuse of felled trees from the construction of the building. The materiality of the building not only was chosen to be locally-sourced and eco-friendly, but the selection of durable and maintenance-free materials was important to Cascadia, as well. Brick veneer, metal siding, and concrete create the exterior material palette, and these materials help connect the building to the aesthetics of the existing campus buildings. This is Cascadia’s first LEED Platinum and the third for higher education facilities in the state of Washington. The Global Learning and Arts Building has been open since 2010, but this certification comes after the last point was secured through the addition of a photovoltaic solar array. This photovoltaic system will be installed this winter. 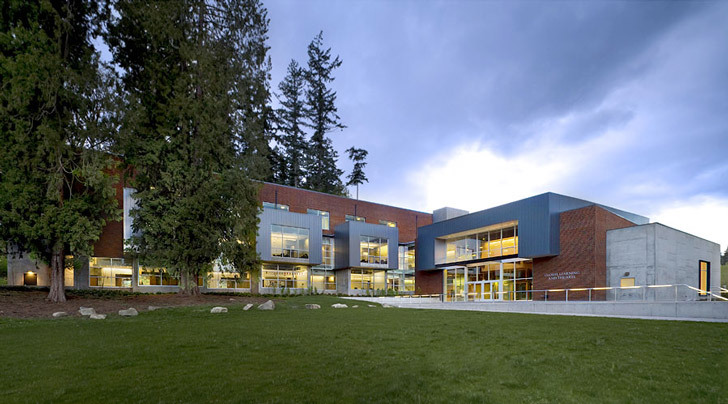 This is Cascadia's first LEED Platinum and the third for higher education facilities in the state of Washington. The more private and contemplative spaces face the forest and provide the occupants with a sense of serenity and calm. The building integrates a variety of sustainable features including rainwater harvesting techniques for greywater, green roofs, and the reuse of felled trees from the construction of the building. The design of the building includes the programmatic separation of private and public spaces, which have different forms of interaction with nature. This bench is an example of the reuse of felled trees from the construction site. The materiality of the building not only was chosen to be locally-sourced and eco-friendly, but the selection of durable and maintenance-free materials was important to Cascadia, as well. The building provides classroom spaces, offices, and large meeting halls for the campus. The Global Leraning and Arts Building has been open since 2010, but this certification comes after the last point was secured through the addition of a photovoltaic solar array.